Fire Fight1 Auto Deploy Halon 1LB Fire Extinguishers with a 4 foot remote located head. 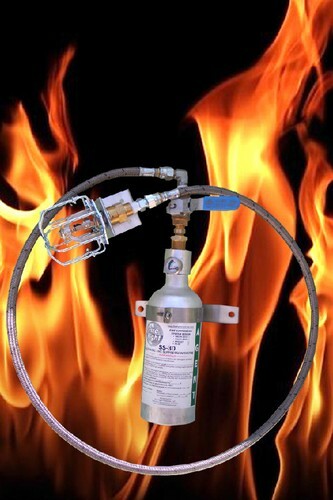 The unit extinguisher can be mounted in one location an with the 4 foot hose gives you a remote location to install the head in small tight locations. The great thing about the Auto Deploy Fire Extinguisher, you do not have to be present at the time a fire starts non do you have to trigger any release. This unit will automaically deploy, extinguishing the fire. The release is set for about 165 degrees. Most RV owners are installing this type of fire stopping protection behind the Norcold 1200 series refrigerators, due to the very high fire risk of the OEM cooling units till they have the Amish built cooling unit installed. We do still have a few customer that will install this safety extinguisher behind their newly replaced Amish cooling units just to have that extra peace of mind. This model can also stand upright or lay down depending on place or mounting locations. Note: Unit will come with needed fittings to make the Auto-deploy head mountable straight or 90 degrees.